NASA must avoid spreading Earth microbes to suspected water in hillside streaks. View from the Mars rover Curiosity at the foot of Aeolis Mons, before the rover starts to climb the mountain. NASA officials are trying to determine whether Earth microbes aboard Curiosity could contaminate the Martian seeps from a distance. If the risk is too high, NASA could shift the rover’s course — but that would present a daunting geographical challenge. There is only one obvious path to the ancient geological formations that Curiosity scientists have been yearning to sample for years (see ‘All wet?’). The streaks — dubbed recurring slope lineae (RSLs) because they appear, fade away and re­appear seasonally on steep slopes — were first reported1 on Mars five years ago in a handful of places. The total count is now up to 452 possible RSLs. More than half of those are in the enormous equatorial canyon of Valles Marineris, but they also appear at other latitudes and longitudes. “We’re just finding them all over the place,” says David Stillman, a planetary scientist at the Southwest Research Institute in Boulder, Colorado, who leads the cataloguing. RSLs typically measure a few metres across and hundreds of metres long. One leading idea is that they form when the chilly Martian surface warms just enough to thaw an ice dam in the soil, allowing water to begin seeping downhill. When temperatures drop, the water freezes and the hillside lightens again until next season. But the picture is complicated by factors such as potential salt in the water; brines may seep at lower temperatures than fresher water2. A study published last month used orbital infrared data to suggest that typical RSLs contain no more than 3% water3. And other streaky-slope Martian features, known as gullies, were initially thought to be caused by liquid water but are now thought to be formed mostly by carbon dioxide frost. Dundas and his colleagues have counted 58 possible RSLs near Curiosity’s landing site in Gale Crater4. Many of them appeared after a planet-wide dust storm in 2007 — possibly because the dust acted as a greenhouse and temporarily warmed the surface, Stillman says. Since January, mission scientists have used the ChemCam instrument aboard the rover — which includes a small telescope — to photograph nearby streaks whenever possible. But the rover’s sheer unexpected proximity to RSLs has NASA re-evaluating its planetary-protection protocols. Curiosity was only partly sterilized before going to Mars, and experts at JPL and NASA headquarters in Washington DC are calculating how long the remaining microbes could survive in Mars’s harsh atmosphere — as well as what weather conditions could transport them several kilometres away and possibly contaminate a water seep. “That hasn’t been well quantified for any mission,” says Vasavada. 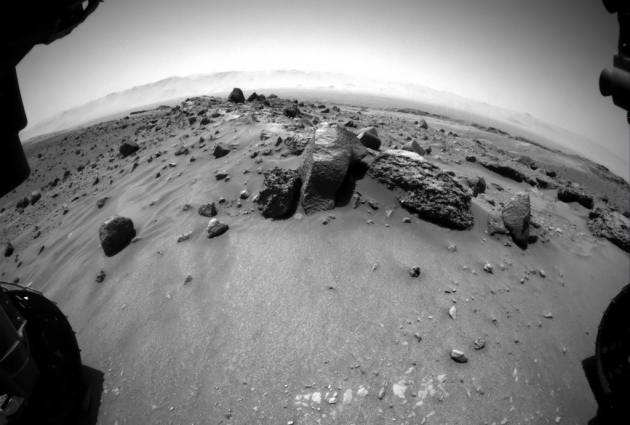 For now, Curiosity is finishing exploring the Murray Buttes. These spectacular rock towers formed from sediment at the bottom of ancient lakes — the sort of potentially life-supporting environment the rover was sent to find. Curiosity’s second extended mission begins on 1 October.